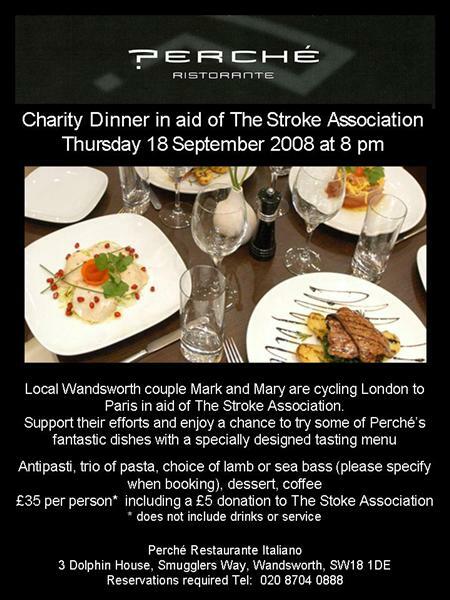 New local restaurant Perché has kindly agreed to host a special charity dinner for us on Thursday 18th September 2008. It is a win-win-win situation - people get a chance to try lots of their lovely food at a special price, we raise some money for the Stroke Association and Giovanni from Perché gets free advertising. Tonight we posted around 450 flyers into the houses all around the area - avoiding those with the "no junk mail" notices. Those poor people will miss out! Charity Dinner in aid of The Stroke Association. Thursday 18 September 2008 at 8 pm. Local Wandsworth couple Mark and Mary are cycling London to Paris in aid of The Stroke Association. Support their efforts and enjoy a chance to try some of Perché's fantastic dishes with a specially designed tasting menu. Antipasti, trio of pasta, choice of lamb or sea bass (please specify when booking), dessert, coffee. £35 per person* including a £5 donation to The Stoke Association. * does not include drinks or service. Perché Restaurante Italiano, 3 Dolphin House, Smugglers Way, Wandsworth, SW18 1DE. Reservations required Tel: 020 8704 0888. How was the turnout? It looks marvelous. Such good people, you are. London to Paris - We Made It!